West Fargo, ND – The Observer is fearful to report that early Sunday morning at around 3 a.m., a zombie was spotted foot-dragging alongside Interstate 94 in West Fargo. This reporter is absolutely certain that this was, without a doubt, a member of the undead or a “walker” as they are affectionately called. Walkers typically come out of hiding after midnight and during periods of intense weather. 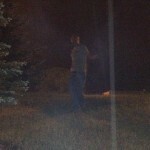 Late Saturday night and into Sunday in West Fargo we had a thunderstorm so I took the opportunity to go zombie hunting. What I saw was the stuff of internet legend. A bald, toothy, decaying walker appeared to me in a clearing from the north side of a ditch along the highway. I was only able to snap one photo of the heavy-breathing ghoul before fleeing since I was unable to take the thing down–I had forgotten my crossbow before venturing out! The walker looked to have procured a new t-shirt and jeans somehow (most likely from its last victim) so at first glance it looked like just another drunk human wandering the grass, but upon getting a closer look I now know what I saw. A flesh-hungry zombie. As far as I know, the creature is still on the loose somewhere in West Fargo. Until the walker is taken out, i’d like to remind everyone to lock your doors at night and if you see a grey shirt/blue jeans-wearing corpse lurking around your home or residence, notify the Observer immediately.